The Northern Arapaho are gaining fame as the first Tribe ever to operate Class III gaming without a Tribal-State compact. After running the “full gamut” of the federal Indian gaming process, the Tribe is now entitled to operate the “full gamut” of casino style Class III gambling without any payments to the State and without any regulation by the State. At lease 249 Tribes have signed Tribal-State compacts for Class III gaming under the Indian Gaming Regulator Act (IGRA) since its enactment in 1988. Compacts uniformly authorize some level of State involvement in Indian gaming and require Tribes to make substantial payments to States. In September of 2005, the Northern Arapaho became the only Tribe to operate Class II gaming without a compact, working instead under Class III gaming “procedures” issued by the Secretary of the Interior. The distinction honors the Tribe and its tenacity. After ten years of struggle, the Northern Arapaho finally overcame all of the barriers created by the IGRA itself and by recalcitrant Wyoming Governors bent on denying the Tribe the single most reliable form of economic development in Indian Country. The end result – the “full gamut” of Class III gaming under the Tribal and federal regulation without any payment to the State and without any regulation by the State – is a noteworthy victory. Negotiations for a gaming compact must be initiated. If a United States District Court rules that the State did not negotiate in good faith, the Court must order the Tribe and State back to the bargaining table for another 60 days. If a compact still is not reached after the additional 60 days, the Tribe may request appointment of a mediator under IGRA. The mediator attempts to resolved disputes and help the parties reach a compact. If the mediator cannot get the parties to reach an agreement, he must select either the Tribe’s or the State’s last best offer for a compact. He cannot draft his own compact or mis and match terms from one proposal with another. Once a last best offer is selected, the State has another 60 days to accept or reject it. If the State accepts it, the parties move forward with a gaming compact. If the State rejects it, the mediator forwards it to the Secretary of the Department of the Interior. In consultation with the Tribe, the Secretary must “prescribe” Class III gaming procedures which are consistent with the last best offer selected by the mediator. 1995– The Tribe enacts and the National Indian Gaming Commission (NIGC) approves the Tribe’s Gaming Code, which establishes the Northern Arapaho Gaming Agency (NAGA). The Tribe begins discussion with the State officials about gaming issues and initiates a six-year investigation of off-reservation gaming in Wyoming, which yielded extensive evidence of “casino-nights” operated by non-profit organizations and political parties across Wyoming. The study focuses on games like roulette, poker, dice and blackjack. 1996– The Supreme Court rules that states cannot be sued under IGRA unless they waive their sovereign immunity (Seminole Tribe v. Florida) (This leaves Tribes without a remedy if their State refuses to negotiate a gaming compact and then refuses to waive it’s immunity from suit.) The Wyoming Governor insists that he needs authorization from the State legislature to enter into a gaming compact. 1997– The Tribe presses for State legislation to resolve gaming issues and allow a compact to be negotiated. The Wyoming Governor opposes the legislation and it fails. 1998-1999– The Secretary of Interior develops regulations to allow a process for Class III gaming where a Tribe has sued their State for negotiating in bad faith, but the State has asserted its sovereign immunity. 1998, 1999, 2000– Wyoming Senator Enzi attaches riders to appropriations bills each fiscal year which prevent the Secretary of Interior from implementing “gaming procedures” for Tribes under the regulations that the Department of Interior has developed. 2000– Anticipating the end of the riders, the Tribe initiates Class III gaming negotiations with the State. Several Wyoming legislators take heightened interest in the matter, but the Attorney General opines that attendance of legislators at gaming negotiations could subject them to personal liability of a compact were not achieved. No compact is reached, the Tribe sues the State and the State waives its immunity from the suit. 2001– The case is argued to the U.S. District Court. The Tribe continues to refine its gaming regulations and expands its “789 Bingo” facility and its gaming agency. Planning development for a new casino begins. 2002– The Court rules that the State failed to negotiate in good faith with the Tribe and orders the matter sent to a federal Mediator, as required by IGRA. Both parties appeal certain issues to the Tenth Circuit Court of Appeals. Pending the appeals, the Mediator rejects the State’s “last best offer” for a gaming compact and approves the Tribe’s proposal as the one which best complies with federal law. The State rejects its last opportunity to enter into a gaming compact with the Tribe. 2003– The Secretary of Interior receives the proposal approved by the federal Mediator and begins discussions with the Tribe regarding issuance of Class III “gaming procedures.” Senator Enzi tries to introduce an appropriations rider similar to those he successfully sponsored in 1998-2000, but with assistance from the National Indian Gaming Association and others, Senator Enzi withdraws his effort. 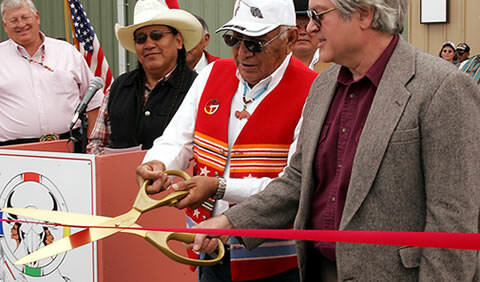 2004– The Tribe breaks ground for its new casino. The Tribe and State present their arguments to the Tenth Circuit Court of Appeals and the Court rules that the Tribe is entitled to the “full gamut of any game, wager or transaction” and that Wyoming negotiated in bad faith with the Tribe. 2005– The Tenth Circuit grants a rehearing requested by the State and reaffirms the earlier ruling that the Tribe is entitled to the “full gamut of casino-style Class III gambling.” In September, the Secretary of Interior issues Class III gaming “procedures” for the Tribe. The State asks the Secretary for $900,000 in payments included in the Tribe’s Last Best Offer for a compact, even though the State rejected that offer in 2002. The Secretary denies Wyoming’s request. For the first time in the history of Indian gaming under the IGRA, the State has no role and will receive no payments based on the Tribe’s Class III gaming. With gaming revenue, the Tribe funds child protection services, scholarships, its tribal college, elder programs, and other important efforts. Recently, Ohio Senator Voinovich introduced amendments to IGRA which attempt to strip from the Northern Arapaho Tribe its hard-earned victory (S.1518). If States can re-write the rules, after years of legal battle are finally concluded, justice becomes a sham. But this is not news in Indian Country – to keep what they have finally achieved, the Northern Arapaho and other Tribes must remain vigilant and aggressive. The Northern Arapaho Tribe is the first ever to complete and implement the entire IGRA statutory process and also the first ever to self-regulate Class III gaming. The struggle was monumental, but the payoff is historic. Other Tribes should study the Arapaho experience, in case gaming “procedures” – rather than a compact – is the right alternative for them as well. IGRA’s primary effect is to provide States with an opportunity to negotiate in good faith and, through that process, to influence how gaming will be conducted by Tribes. When States fail to genuinely respect the sovereignty of Tribes, they risk losing the chance to influence Indian gaming altogether. For Tribes, the Northern Arapaho experience shows that planning and persistence in both the legal and the political arena are required before they can exercise even the more limited sovereign authority recognized by IGRA. In the end, tenacity won the “full gamut” of casino style gambling – flexible Class III gaming without any State interference and without any payments to the State for the right to exercise inherent tribal sovereignty. Consistent with history, Tribes must fight to keep what they have struggled to earn.